Car Hire Desks at Dublin Airport. Renting a car Ireland really is the very best way to ensure that you are able to explore the country fully, as by doing so you gain the freedom to follow your own itinerary. Although sorting out a car rental in Ireland can seem quite a complicated process to the uninitiated, rest assured that once you’ve done a bit of research into such issues as the CDW Waiver (discussed later), you’ll be on the road in no time. Each car rental in Ireland provider will offer slightly different packages, including the CDW waiver, so it is well worth shopping around to ensure that you get the right vehicle to suit your purpose. To save time, you may wish to use a comparison service such as Argus Car Hire or Irish Car Rentals. If you require any extras such as child car seats, air conditioning or a GPS system, enquire about the charges that will be applied for these at the time of booking. If you are flying into Ireland on holiday, then it makes sense to pick your car up at the airport. You may have to pay a slight surcharge if you choose to do so, but in terms of convenience you will probably find it is well worth it. If you are planning to drive from the Republic of Ireland to Northern Ireland, or if you would like to use different pick-up and drop-off points, then it is easy to arrange and you can ask about this at the point of booking. Try to time your drop-off so that you are not charged a whole extra day. So if you pick your car up at 9am, for example, you should aim to return it at a similar time on the day you return it to the hire company. Make sure to add your flight details when booking. 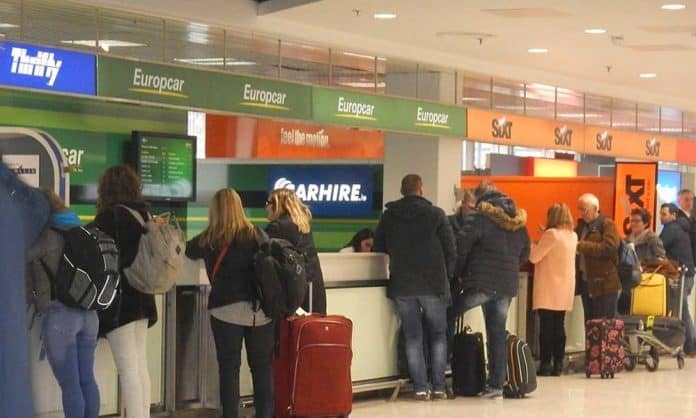 This is because the Ireland car rental company can then take any flight delay into account and will not charge you any extra or assume you are not showing up and rent the car to someone else. It pays to think ahead when sorting out your self-drive Ireland car rental. Booking ahead of time should ensure you get the right car at the best possible price to suit your needs. The hire costs and the CDW waiver charge (if applicable) must be made by credit card. Cash, debit cards and cheques are not accepted. Visitors booking car rental in Ireland are required to produce a current driving licence (issued by their country of residence). You may also need to show your passport as a second form of identification. The majority of hire cars in Ireland are manual, so if you prefer an automatic, you may need to book it in advance. Automatic cars are more expensive to hire, but it is advisable to stick with what you are used to, especially if you are in an unfamiliar country. The rate you will be charged for your car hire is dependent on a number of factors, with the most critical of these being your age. If you are aged between 25 and 74 at the time of rental, you should meet the criteria for the very best deals. Those aged over 75 will find it harder to rent a car and may require some additional proof of their suitability to drive. Those aged under 21 are not permitted to rent a car in Ireland. Third-party insurance is mandatory and should be included in the rental price. However, third-party insurance only covers you for vehicle damage or personal injury caused to other people. Rental companies will generally also offer insurance covering theft which will limit your personal financial liability for the theft or loss of the rental car. CDW (Collision Damage Waiver) will limit your financial liability for damage (there are exclusions) caused to the rental car while it is in your possession. PAI (Personal Accident Insurance) is designed to cover the costs of personal injuries. CDW is essentially a basic form of insurance that covers the rental car against theft or damage. It is normally offered as standard when hiring a car in Ireland, but there may be exceptions so do check with the salesperson exactly what is included before signing on the dotted line. If you don’t have CDW and the car is damaged, you could find yourself liable for the total cost of repair or even replacement. You will find that there is a non-waivable excess fee attached to all CDWs whereby the rental company will offer extra cover against this additional fee. If you opt to purchase a separate policy from a third party to cover the excess, you will normally find that your rental company will require you to put down a security deposit. This will be taken, normally when you arrive to pick the vehicle up, in the form of a (pre-authorised) charge on your credit card. Note that if you opt to buy an excess waiver directly from your rental company, you will not need to provide a security deposit. If you do decide to buy a waiver from a third party, you should read the paperwork very carefully – particularly the section that concerns exclusions. Many people do opt to go for a third party, such as insurance4carhire, to take out insurance to cover the excess. A policy of this type will also cover any damage to the undercarriage, roof, tyres, windows and headlights (but not interior damage) which may not be covered in the rental company’s insurance. You may find that it works out cheaper to go down this route, although you will have to be more organised and shop around in advance for the most competitively priced cover. In terms of the total cost, you will also need to factor in the VAT (value added tax) plus any additional charges such as those for fuel. Fuel return policies do vary from company to company. Some will ask that you return the vehicle with a full tank; others want it empty. This can have a cost implication, so do check. It is very important to carry out a thorough inspection of your hire car before you depart in it. Walk all the way round the car (preferably in daylight) looking for any indications of damage. Make sure the spare wheel and tool kit are in situ. If you do notice any issues, let the rental company know straight away and don’t leave until the issue is sorted out to your satisfaction. When you return the vehicle, you need to ensure that it is checked over by the rental company, preferably in your presence, and that any damage is noted correctly to avoid any unexpected charges. In Ireland, you will find that a number of the motorways are toll roads. Generally, the toll charge is paid at the designated toll barrier using cash or an Etoll token. If you are using West Link Bridge you need to pay online, although some car hire companies will take care of this for you. To avoid the possibility of accruing penalty charges, do check with your rental company how it manages toll charges. There are certain driving laws that you must adhere to at all times. Seatbelts must be worn in both the front and back seats. The law concerning drinking and driving is very strict indeed, and the best advice is to simply refrain from drinking at all if you will be driving. Cars drive on the left in Ireland. At any junction where there is no priority, you should give way to traffic on the right. At pedestrian traffic lights the flashing amber light signifies that pedestrians have priority, although you may proceed carefully if it is clear. You must always turn left when entering a roundabout, following it clockwise and giving way to traffic on the right. Many rental cars in Ireland run on diesel rather than petrol. It is absolutely vital that you check which fuel your car takes before setting off. Putting the wrong fuel into the vehicle can damage it, and you may be held responsible for the cost of repair. At the fuel pump the nozzles will be clearly labelled, so double-check before filling up. If you do inadvertently put the wrong type of fuel into the vehicle, don’t try to continue your journey. Call your rental company and ask them how to proceed. When you are driving through the Republic of Ireland, you will notice that the place names and signposts are written in both English and Gaelic. Distances are expressed in kilometres and national speed limits in kilometres per hour. If you cross into Northern Ireland, this changes to miles and mph. In the Republic of Ireland, you should note that the speed limit for urban areas is 50kph, rising to 80kph on rural local roads and 100kph on national roads in rural areas (this includes the majority of duel carriageways). On motorways the speed limit is 120kph. In Northern Ireland, you need to know that the speed limit is 30mph in urban areas, 60mph on rural open roads and 70mph on the motorways, unless indicated to the contrary. As in most countries, if you exceed the speed limit you may be fined or subject to other penalties. In addition, should you park in a restricted area you could be fined, and in some circumstances your vehicle may be towed. A single yellow line indicates some parking restrictions, and you must never park on a double yellow line. The renter will be held responsible for any parking, clamping or speeding fines that they may incur. Never leave valuable items on show when you leave the vehicle, and always try to park in clearly designated areas. It makes sense to shop around in advance to get the very best value for money. It’s important to compare like for like, so check what each policy includes in terms of insurance, as discussed above, before making your final decision. If you are planning your car hire well ahead of time, do bear in mind that some companies will only quote within a six-month window of your date of travel. Although it can be time-consuming, it can be well worth your while to check the terms and conditions of any policies that seem to be good value. It is also a good idea to check the reviews left by previous customers, as this is a great way of getting an overview of the level of service provided and could also potentially alert you to any red flags. Each rental website will ask you for certain details in order to give you a quote. If there is anything that you don’t fully understand, call the company and ask, as you could unwittingly push up the cost of your car hire if you give an inaccurate answer.